I’ve always wanted to illustrate a map. Luckily I recently got commissioned by a San Francisco resident to do one of the harbor area where she and her family go for walks. This is what I came up with. Now I’d like to do one for my Brooklyn neighborhood and maybe the westside of Manhattan. Yesterday was a busy day, I ran around the city showing my portfolio to some design and advertising companies, then I went to see the documentary on Valentino which I reccomend seeing at your local art house theater. What a character he is! Then I met up with one of my best and oldest friends also known as shop darling on the Elle.com. There’s really nothing like spending time with an old friend. We could have stayed together till the sun came up talking and catching up. Now I’m in a great mood for the weekend. I hope you have something fun planned, or something super relaxing. Thanks again for reading Maquette. XO. This is beautiful! You should do one for Fire Island and the Hamptons! The sailboat in the sea is so charming! thanks vi! Did you see that I linked to your blog in the post? aw. i can see the water and the ferry bldg. from where i am now. very nice piece sam. i like your watercolory things. and your new header! Lovely map! Enjoy your weekend. I’m going orienteering and I wish the orienteeing maps were this nice! thanks Yasmine!!! I wish I were there with you now! thanks Lisa. I’ll make you a copy if you want? 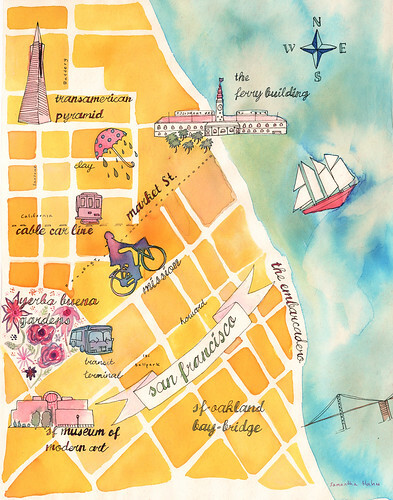 I love maps and this is a really beautiful one. I love the softness of the watercolors. thanks so much Kathy. I’d like to try a few more in this style….I’ll post them as I go along. Thanks so much for the compliment! thank you so much Iva!!! I appreciate the compliment so much.